We live in busy times. The demands of work and family and personal activities can leave one with little room to pay attention to a healthy diet. When it comes to food, a person on the go doesn’t always make the best choices. When you’re hungry, a fast food meal that takes a couple of minutes to order at a drive through window can be so much more appealing than one that takes much more time to plan and prepare. Fast food, also known as “junk food” is fine occasionally, but when it becomes a habit, it can lead to weight gain and health problems down the road. This food is often low in fiber, high in fat, sugar and calories. The draw of fast food is it is both quick and tasty, but unfortunately, it isn’t that great for your overall well being. It may seem difficult to find quick healthy meals when you’re on the run, but with a little thinking ahead, you can be well on your way to a healthier diet. If you are flustered just by the thought of cooking, you might start off by making healthier choices when you’re grabbing food to go. The Mayo Clinic outlines several tips for takeout food. They suggest keeping the calories down by watching the portion size, choosing the healthiest side dish available to you, going for fresh greens whenever possible, opting for grilled foods over fried items, asking for healthful substitutions such as low fat mayonnaise or dressing, and foregoing the sugary drink that often accompanies a fast food meal. Of course, the best option is to think ahead. Become a meal planner. Choose quick healthy recipes that you can take with you and eat on the run. When you plan ahead you have the advantage of knowing exactly what you are eating. You have more control over your choices, and you can choose anything: fresh fruits and vegetables, whole grains and lean meats, even an extra treat from time to time. Instead of feeling the frustration of having to pick from a menu of unhealthy items, you truly get to have it your way. Planning meals can be fun, and there are plenty of fast healthy recipes available; you can find great resources for these online or by shopping in the cookbook aisle of your local bookstore. You can try the recipes for 5 weeknights below to get you started. Serve with sauteed zucchini and quick cooking brown rice. Pat fish dry with paper towels. Cut fish into 4 serving size pieces. In a small bowl combine basil, melted butter, garlic, salt, and black pepper. Brush mixture over both sides of fish. Place fish on the unheated rack of broiler pan. Broil 4 inches from heat for 8 to 12 minutes or until fish flakes easily when tested with fork, turning once. An stove top grill can also be used to cook the fish. Serve with a green salad and bread sticks. Combine first 6 ingredients in a medium bowl. Add 2 teaspoons oil, tossing to coat. Cook pasta according to package directions. Drain well. Heat a large nonstick skillet over medium-high heat. Add the remaining 1 tablespoon oil to pan, swirling to coat. Add garlic to pan; sauté 30 seconds. Add zucchini; sauté 3 minutes or until crisp-tender. Add broth; bring to a simmer. Stir in pasta and 1 1/2 tablespoons basil; toss well. Remove from heat; stir in tomato mixture. Place 1 1/2 cups pasta mixture in each of 4 bowls; top evenly with remaining 1 1/2 tablespoons basil. Sprinkle each serving with 4 teaspoons cheese and 2 teaspoons almonds. Serve pork with orzo and green beans. Combine flour and salt in a shallow dish. Place breadcrumbs, cheese, and pepper in a shallow dish; place egg white in another shallow dish. Dredge pork in flour mixture, dip in egg white, and dredge in breadcrumb mixture. Coat pork with cooking spray. Heat oil in a large nonstick skillet over medium-high heat. Add pork to pan; cook 4 minutes on each side or until done. Remove from pan; keep warm. Add broth and remaining ingredients to pan, scraping pan to loosen browned bits. Cook 2 minutes or until reduced to 1/4 cup (about 2 minutes). Serve with pork. Heat olive oil over medium-low heat in large skillet. Brown chicken breasts on each side and remove to a plate. Sauté garlic and red pepper flakes for about 1 minute. Add onion and peppers and continue cooking until tender and soft, about 10 minutes. Stir in tomatoes, Italian seasoning, parsley, salt and pepper, and broth. Serve with mashed potatoes and ladle sauce over chicken and potatoes. Make a quick soup and while it simmers, make the sandwiches. Cook 3 chopped garlic cloves and some red pepper flakes in 1 tablespoon olive oil. Add 3 cups chicken broth, 1 head chopped escarole and simmer 15 minutes. Add 1 can low sodium white beans, parmesan and salt to taste. An alternative to a classic panini is a piadina. Piadine are flat, almost tortilla-like bread that is from the Emilia Romagna region in Italy. They are almost always grilled. 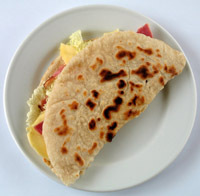 Most of the same ingredients in a normal panini can be put in a piadina; just the bread changes. Turkey or ham or grilled vegetables can be used in place of any of the ingredients below. You can cook these sandwiches on a Panini Press or a grill. Heat the oven to 250°F. Heat the oil and garlic in a skillet over medium-high heat until the garlic starts to sizzle steadily and browns in places, about 2 minutes. Add the spinach, sprinkle with 1/4 teaspoon each salt and pepper, and cook, tossing, until just wilted, about 2 minutes. Transfer the spinach to a colander. Let cool a couple of minutes, discard the garlic, and gently squeeze out the excess liquid from the spinach. In a medium bowl, toss the spinach with the fontina, parmigiano, sun-dried tomatoes, and 1/4 teaspoon pepper. Set the 4 pita halves on a work space and top each with 2 slices of prosciutto on one side of the bread. Top each evenly with the spinach mixture and fold in half. You will have four piadinas. Brush sandwich very lightly with olive oil and place in your panini maker. Follow directions for your maker. You can also grill the sandwich on a stove top grill pressing down on the sandwich with a large spatula. Grill until lightly toasted. Turn sandwich and press. Grill until toasted. Transfer to a baking sheet and keep warm in the oven. Cook the remaining sandwiches in the same manner.